ABDEL FATTAH AL SISI, President of Egypt, said that Egypt and the Middle East had been, in recent years, confronted with a danger that required creating brighter prospects and opportunities for youth. Counter-terrorism efforts had, so far, been defensive. Alongside those efforts, world leaders needed to channel the energy of youth away from extremists and false ideas and towards a peaceful future. There existed no doubt that more than 1.5 billion Muslims had refused to subscribe to the view of the terrorist minority that claimed to speak on their behalf. But many in the international community had refused to recognize that Muslims and non-Muslims alike were at war with the same enemy. The United Nations had witnessed Libya break up into extremist factions — a situation which motivated the formation and signing in Skhirat of the political accord to end the Libyan crisis. World leaders’ efforts should focus now on rebuilding the Libyan State and empowering it to effectively defeat the terrorist groups before they could establish a base from which to target Libya’s neighbours and extend their reach into the depths of Africa. Egypt had also observed the ways in which extremists had exploited the legitimate aspirations of the Syrian people to drag the nation into conflict. His country called on the Syrian national parties to meet in Cairo to formulate a clear plan to build a democratic country that would preserve the Syrian State and its institutions, as well as protect its diversity and national identity. Furthermore, Egypt’s political and military support for Yemen and its Government had taken place at Yemen’s request, and stemmed from Egypt’s commitment to preserving Arab national security, he said. International leaders must exert the necessary efforts to resume the transitional peace process, in accordance with the Gulf Initiative and its mechanisms, as well as relevant Security Council resolutions. Finally, the increasing plight of refugees fleeing destructive armed conflicts reaffirmed the need to work towards confronting the scourge of terrorism, in addition to creating channels for legal immigration. Resolving the conflict in Palestine and empowering the Palestinian people to exercise their right to self-determination would effectively eliminate one of the most influential factors of the region’s instability and dangerous pretexts used to justify terrorism. Egypt realized the importance of other factors, besides defeating extremism, to achieve stability and comprehensive development, he said. Last March, the country launched its own vision for post-2015 development, in conjunction with the international community’s endeavours. It was Egypt’s hope that the 2030 Agenda would take into consideration the importance of common but differentiated responsibilities in confronting global challenges based on disparities in capacities and resources, as well as the diversities of cultures. 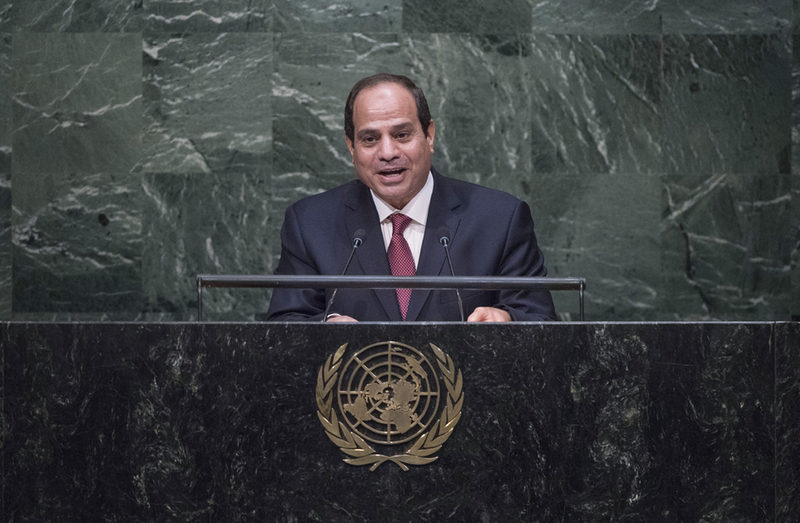 Additionally, through its nomination to a non-permanent seat in the Security Council for the coming two years, Egypt aspired to enhance its role in consolidating international peace and security.